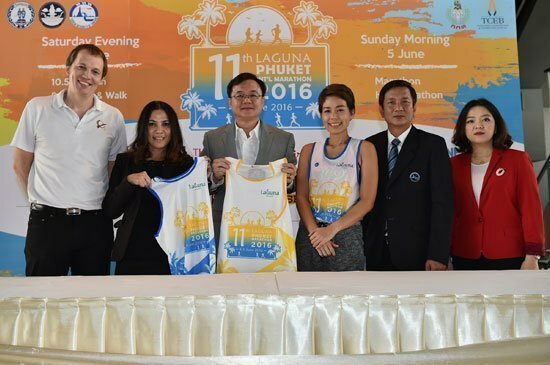 2016 Laguna Phuket International Marathon, the 11th edition of the annual Run Paradise race which brings thousands to Phuket each year, was previewed on Thursday 24 March for media by organisers and sponsors at Vertigo Too, Banyan Tree Bangkok. The Bangkok conference was addressed by Phuket Vice Governor Kajornkiet Rakpanitmanee; Khun Prapa Hemmin, Director of Sales-MICE & Corporate Events, Laguna Phuket; representative from Tourism Authority of Thailand (TAT), Thailand Convention and Exhibition Bureau (TCEB) and Go Adventure Asia Co., Ltd. Also presented at the Conference were sponsors and partners of the event. This year’s race which includes marathon, half-marathon, 10.5km run, 5km walk/run, and 2km kids run expects to see 8,000 participants on Saturday 4 and Sunday 5 June at Laguna Phuket. “Laguna Phuket International Marathon plays a vital role in promoting Phuket as world’s sport tourism destination. It also helps increase cash flows in Phuket during the green season which is beneficial to the locals.” said Khun Prapa Hemmin, Director of Sales-MICE & Corporate Events, Laguna Phuket. Like every year, athletes booking their slots in Laguna Phuket’s 2016 marathon and triathlon series are being asked to raise funds through donations and sponsorships for the resort’s long established “Laguna Phuket Foundation” to operate its various charitable programmes. Over the years, millions of baht was raised to fund such initiatives as local school renovation, survival swim, mobile learning centre and Seedlings programmes. “It is our hope to make the race a Run Paradise, at which runners enjoy running, meeting their peers and participating in fulfilling charitable causes” she concluded. Laguna Phuket Foundation will continue its fundraising activities at Laguna Phuket’s annual sports events including the marathon in June and Laguna Phuket Triathlon in November this year.